RMS has provided an updated economic and insured loss estimate for damages caused by wildfires across the Sonoma, Napa, Solano, Lake, and Mendocino counties of California, of between $6 billion and $8 billion. The estimate includes losses due to property damage, contents and business interruption as a result of fires to residential, commercial, and industrial business lines, but does not include agricultural crop losses or automobile losses. RMS explains that wildfire insurance penetration is high in standard homeowners policies and commercial policies, which suggests the insured loss will be similar to the economic loss for the event. RMS notes that according to the California fire authority around 7,800 structures have been destroyed by the fires and roughly 600 damaged. 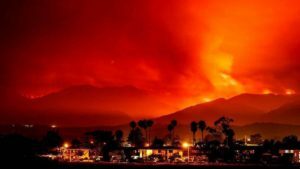 However, the California fire authority has now estimated that 8,900 structures have now been either destroyed or damaged, suggesting the losses could be even higher. Using GeoMAC data, RMS’ high-resolution exposure database identifies around 11,000 structures and over $10 billion in total exposure sit within the fire footprints. “With reports of 8,400 damaged or destroyed structures, this indicates that the proportion of properties affected equates to roughly 70 to 75 percent, which is the highest proportion observed in the RMS review of historical events of this scale and magnitude,” explains RMS. Typically, says RMS, between 15% to 50% of structures are affected by wildfires within a fires footprint. The catastrophe risk modeller stresses that uncertainty remains with the loss estimate for this event, warning that the overall cost could rise in the weeks and months ahead.